We are listed among the prime Electronic Water Level Monitor Manufacturers and Suppliers from Hyderabad, Andhra Pradesh. 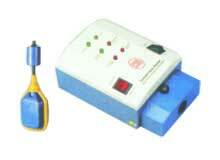 The Electronic Water Level Monitor offered by us, is widely used for automatic and Hands free pumping operations. Widely used to regulate and control fluctuating voltage and keep your motor safe, our Electronic Water Level Monitor has been termed as the best available Pumping Accessory available in the market.